Is Woolly Mammoth Ivory Legal or Not? Every serious collector wants to own, at least, one object that is truly unique or very rare. For some people, it can be an Old Master painting; for others – it is an exclusive luxury car. There are also people collecting authentic artifacts and antiques made of various materials, including mammoth ivory distinguished by its stunning color patterns. However, the question is whether genuine mammoth tusks, bone, teeth, and pieces of the prehistoric ivory are legal or not. 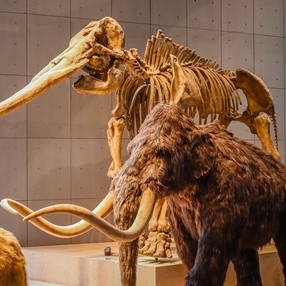 For tens of thousands of years, the remains of woolly mammoths were locked in permafrost in the Yukon, Alaska, and Siberia. However, everything changed when warming temperatures melted the layers of ice, bringing valuable mammoth ivory within grasp. Moreover, with the development of the international shipping industry, the trade of mammoth ivory has become a very successful business all over the world. And yes, it is legal in most countries, unlike the elephant ivory trade that has been banned since 1990. For today, 50% of the mammoth ivory found in the Arctic tundra is sold legally to China, which has the world’s biggest mammoth ivory market, with Hong Kong as the major destination for collectors and antique dealers. However, whether it comes to the whole pieces of the prehistoric ivory or various objects made of it, including ornamental tusks, boxes, and jewelry, there are still many limitations related to the global trade in mammoth ivory. For example, New York, New Jersey, Hawaii, and California have banned any sales of mammoth ivory. The same applies to India that does not let this valuable material, as well as any objects made of it, into the country. So if you do not want to be involved in the illegal transportation of mammoth ivory, it is of utmost importance to deal with only reliable shippers who know all the nuances of the mammoth ivory regulations. At Fine Art Shippers, we can ship fine art and antiques of any kind, including mammoth ivory, as long as it is permitted by law, of course. Moreover, we are experts in the CITES shipments and work with experienced attorneys who can help our clients obtain all the necessary permits and guide through the entire process of transportation. Thereby, whatever mammoth ivory shipping assistance you need, Fine Art Shippers will be happy to help! Just let us know about your problem or simply request a free shipping quote right from this website!